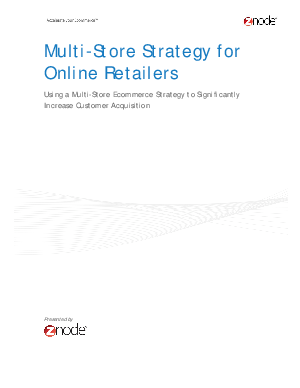 Using a Multi-Store Ecommerce Strategy to Significantly Increase Customer Acquisition. As Ecommerce becomes a leading strategy for businesses, online retailers are presented with a challenge: how to increase sales by personalizing the customer shopping experience and strengthening the brand. The solution is to develop a multi-store strategy that “divides and conquers” this challenge. Retailers can develop several online stores that cater to distinct customer demographics, optimize separate checkout flows based on product, or improve conversion rates in marketing campaigns. Ultimately the ability to launch a multi-store strategy relies on the Ecommerce platform’sability to quickly deploy and easily manage multiple storefronts with high ROI and low ITinvolvement.